Learning from the mistakes of others as we wrap up 2015 - A Digital Marketing Agency | IIAS - International Internet Advertising Services Inc.
TED won the 2015 People’s Voice and Webby Award in the Best Home/Welcome Page category. In addition to a colourful display with lots of topical news options, they had a simple menu: Watch, Read, Attend, Participate, About. Makes perfect sense. The Design Museum won the 2015 People’s Voice award at the Webbies in the category of Best Navigation/Structure. We really loved the home page with a click-on pull-down menu. the sub-menu fonts were so teenie weenie that we could hardly read them. Remember the baby boomers are getting older and they (we) don’t like to squint! Global marketing is always a challenge, and when it comes to translation, well, you need to be very, very careful. 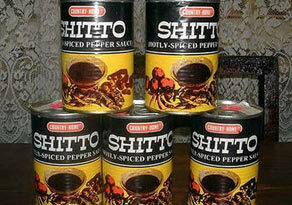 In Ghana, Shitto is a most appropriate name for this pepper sauce. In English speaking countries, not so much. Be sure to know how your brand and product names will be interpreted in different languages and dialects. Do we even need to explain why this was considered offensive? Humour can be used very effectively but this world has become hyper-sensitive about a great number of issues – use extreme caution! All professional writers know the importance of proper spacing and punctuation, so when those features are not permitted, as in hashtags, you’d better be able to see ALL of the different ways your #oneverylongstringofletters could be interpreted. #nowthatchersdead – Who’s dead, Thatcher or Cher? #therapist – Is this discussion about counselling or rapists? Hashtags are often created on the fly, but when you’re in business, you definitely need to plan ahead and make sure you’ll be creating a buzz for the right reasons. Here’s to staying off such lists in 2016!